TogetherRising #sHERo Award | "A Day in The Life" TogetherRising #sHERo Award – "A Day in The Life"
If I want to see change in this world, then I must be the change myself. If I want to empower and inspire women then I must be transparent and authentic in my own life. – I need to walk my talk. Right?! The best part of working in the anti-trafficking movement is being a part of something bigger than myself. To realize that my pain is being used for someone else’s healing is pretty amazing to me. I love to see the transformation in women’s lives after I have worked with them or after they have read my blog. I love to bring hope and healing to women on the streets, in programs and in my own community. I have been sharing my story of survival for a few years now and most of the time after I share, women in the audience will come up to talk and they let me know the ways I have impacted them. A lot of them self-identify and say that they share very similar stories or can identify with most of it. Others are taken back by my bravery and courage to speak my truth. At first, It wasn’t easy to get up and share the details of my trauma in public. But with some encouragement, prayer and guts, I did it. I have never felt so free in all my life. To witness the instant impact on women’s lives was deeply moving for me. Early on in my speaking, I had some training on story telling and this helped me shape my story in a way that made sense for people. Because trafficking doesn’t happen in a vacuum and for me it wasn’t a one time event, I wanted to share it in a way that highlighted my vulnerabilities, the grooming process traffickers use and the reasons why women “stay so long”. I have never once just stood up on a stage and shared the horrific details of my life. Rather, I have raised awareness, educated and delivered hope and healing to many. Best of all, my story points to the One who has saved and redeemed me! Praise Jesus! Because of all this, I was recently nominated by 4 amazing friends for an award through Together Rising which is a non-profit that was created through the blog, momastery.com. I knew about the nomination but had forgotten about it. My friends and I made plans to meet at a local restaurant on the last Tuesday in July because my outreach ministry, Bags of Hope, was the restaurant’s “Cause” for the month with 15% of each bill getting donated to the ministry. 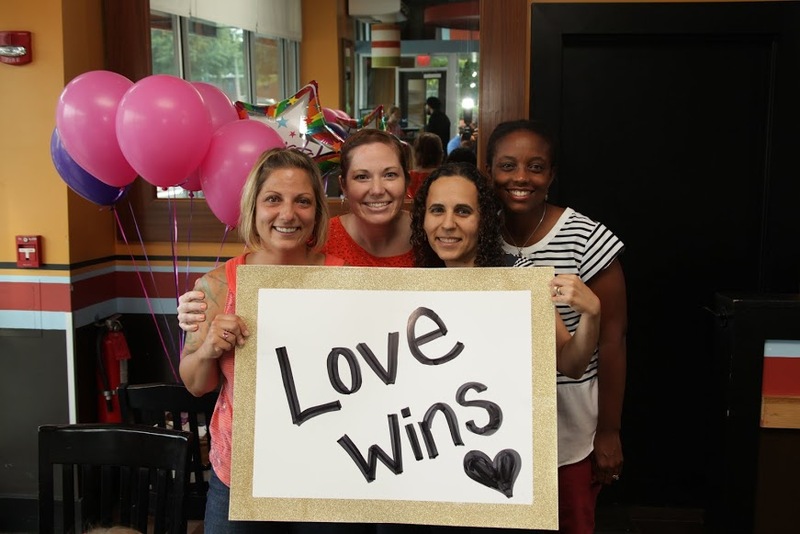 Whenever my friends walked up to me with a big sign that read, “Love wins! !” and big smiles, I knew something was up. They excitedly announced that I was the winner of the award and presented me with two checks! One check would go directly to the ministry and the other one could be used for whatever I wished. They said.. “Take your kids to Disney.. Put a down payment for a new car!! Whatever you’d like. It’s for YOU.” I was overcome with emotion, gave them huge hugs and yes, I cried! I am still basking in the blessing. I feel even more loved and supported on this journey. I’m still not sure what I will use the money for! In the past, I made many impulsive and unwise decisions. This time around I want to be deliberate and prayerful with such a big blessing. The real reward came while I was putting my 4 year old daughter to bed that night. We were saying our prayers and she said, “Mom, you are so strong and brave. Like a Superhero! !” I smiled and kissed her on the cheek and prayed that she would go out into the world and do the same – Inspire, Encourage and Build up Others. ToGetHerRising! © Copyright 2015. JasmineGrace. All rights reserved.